Recently I discovered a neat little utility called WizTree, which can be used to report on space used by files and folders on a drive. There are many utilities out there that can do that, but this one supports running on the command line which makes it very useful for scripting scenarios. It also works extremely quickly because it uses the Master File Table on disk instead of the slower Windows / .Net methods. I wanted to create a disk usage report for systems that have less than 20GB of free space – the recommended minimum for doing a Windows 10 in-place upgrade – so that I can easily review it and identify files / folders that could potentially be deleted to free space on the disk. I wanted to script it so that it can be run in the background and deployed via ConfigMgr, and the resulting reports copied to a server share for review. The following script does just that. First, it runs WizTree on the command line and generates two CSV reports, one each for all files and folders on the drive. Next, since the generated CSV files contain sizes in bytes, the script imports the CSVs, converts the size data to include KB, MB and GB, then outputs to 2 new CSV files. 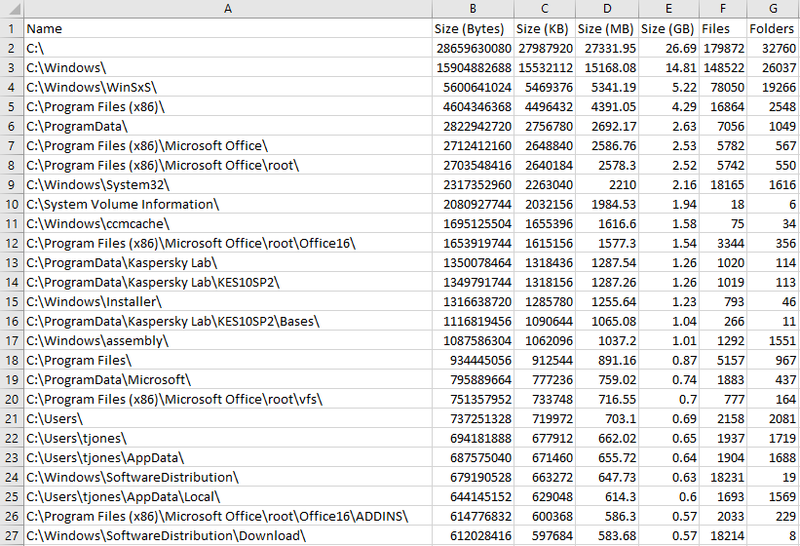 The script then generates 2 custom HTML reports that contain a list of the largest 100 files and folders, sorted by size. Next it generates an HTML summary report that shows visually how much space is used on the disk and tells you how much space you need to free up to drop under the minimum 20GB-free limit. To use the script, simply download the WizTree Portable app, extract the WizTree64.exe and place it in the same location as the script (assuming 64-bit OS). Set the run location in the script (ie $PSScriptRoot if calling the script, or the directory location if running in the ISE), the temporary location where it can create files, and the server share where you want to copy the reports to. Then just run the script in admin context.